Law Day, held annually on May 1, is a national day set aside to celebrate the rule of law. Law Day underscores how law and the legal process contribute to the freedoms that all Americans share. Law Day also provides an opportunity to recognize the role of courts in democracy and the importance of jury service to maintaining the integrity of the courts. 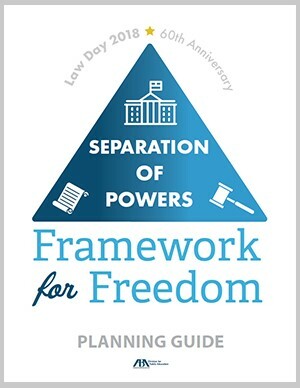 The ABA notes the following about the 2018 theme, "Separation of Powers: Framework for Freedom" takes a nonpartisan look at checks and balances and how that applies to our government. The 2018 Law Day theme intends to go a step beyond what we learn in textbooks in order to underscore the importance of this system of government set forth by the Founding Fathers. Pennsylvania takes a slightly different approach to observing Law Day by focusing on children. Through classroom visits by lawyers and judges and an outstanding set of free law-related lesson plans prepared for K-College classrooms, the Pennsylvania Bar Foundation, Pennsylvania Bar Association and county bar associations across the commonwealth work with schools to educate children about their legal rights and responsibilities in the new millennium. The free lessons and materials are designed to be informative and engaging for all students. Law Day provides Pennsylvania lawyers and judges with a wonderful opportunity to become involved in their local communities. Law Day is funded by the Pennsylvania Bar Foundation.